Developer @hamzasood has again unearthed details of what we could expect in future devices, as within iOS 9 beta there is evidence detailing the future of front facing cameras. 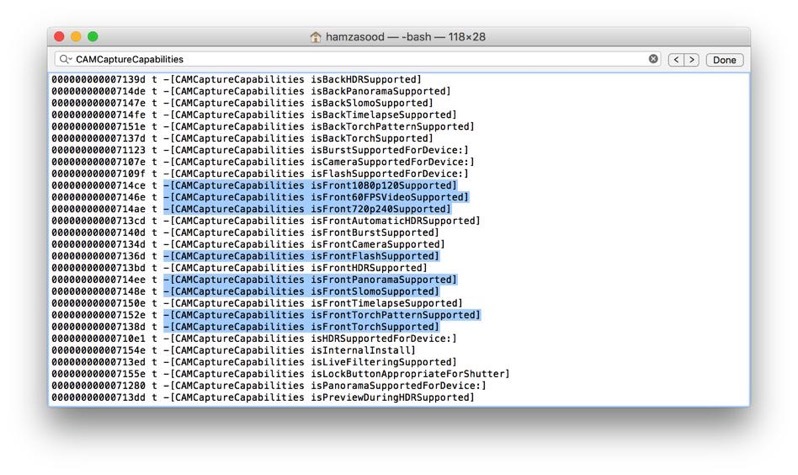 According to code in iOS 9 beta, references are made for front facing cameras to possibly support 1080p resolution, 240fps slow mo, panoramic mode support and also flash. This means your ‘selfie’ game is about to be taken to a whole new level, soon. Current front facing cameras on the iPhone 5c or newer are only 1.2 megapixels with 720p video recording capabilities. Yesterday Sood also detailed internal watchOS settings, along with various internal settings for debugging and multitasking in iOS 9 as well. iOS 9 is set to debut this fall, while users can expect iOS 8.4 to be publicly released on or before June 30, when iTunes Music is set launch worldwide in 100 countries.